Last month, I discussed new research about the origin of the scattered disk object named Sedna, as well as 2012 VP113 (1). This new work by Lucie Jílková and Simon Portegies Zwart of Leiden Observatory in the Netherlands proposes that Sedna was captured from the Sun during a relatively close stellar fly-by (2). Sedna, the researchers contend, had previously belonged to this other star, which they name 'Star Q'. Star Q was most likely a heavier relative of the Sun's, they say, in that it arose from the same birthing star cluster or stellar group. "...Sedna discoverer Mike Brown of the California Institute of Technology contends that the object most likely is native to our solar system and got yanked outward by the gravitational tug of the sun's siblings—a simpler scenario. The difference between a 'gravitational tug of the sun's siblings' and the close incursion of a 1.8MS star from the same birthing pool as the Sun may seem like splitting hairs. But Dr Brown's solution leaves open the door for the Sedna-effect to have been caused by a closer, bound sub-stellar object - like a brown dwarf companion which, I imagine he would argue, has since been lost from the solar system. At least we now have a scientific argument which enables us to decide one way or the other in the coming years. "Sheppard noted that there may also be something bigger lurking in the region as there are hints of a possible planet that is bigger than Pluto and possibly bigger than the Earth. In a report published in the journal Nature in 2014, Sheppard and Chad Trujill (sic) (4), from the Gemini Observatory in Hawaii, compiled evidence that suggests there could be a massive perturber or a large gravitationally disturbing object that lurks at the outer Solar System. "Mike Brown, the Caltech astronomer who discovered the dwarf planet Eris, tells us [The Washington Post] by e-mail, "Scott's claim is that all of these objects come to perihelion at the ecliptic, and all are going from below the plane to above the plane at perihelion." "So there's something seemingly non-random, indeed a striking pattern, in how these extremely distant objects move around the sun. And that suggests that there's something out there influencing them -- or, more precisely, making other types of orbits unstable. "Sometimes patterns involving small numbers of objects or events disappear upon further investigation. The 2014 paper (4) was based on just a dozen objects. But Sheppard is preparing a new paper based on more recent discoveries: "We found a few more extreme Kuiper Belt objects and they continue to follow the trend." "Using the data collected by the spacecraft scientists looked at seven years worth of photographs, carefully logging its position using craters as markers. What they found was that Enceladus' orbit was unlike anything they'd seen before. Not only was it changing speed as it moved around the gas giant, but it also had a slight wobble. They then took this wobble and applied it to various structural theories and found that only one composition could allow for such a degree of movement. 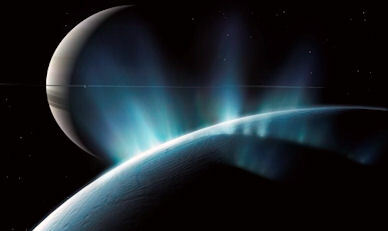 "Matthew Tiscareno, a Cassini participating scientist at the SETI Institute, Mountain View, California, said, "If the surface and core were rigidly connected, the core would provide so much dead weight the wobble would be far smaller than we observe it to be, this proves that there must be a global layer of liquid separating the surface from the core." The rich and often bizarre topography of Pluto has been revealed in far greater deal as new photos continue to get sent back by the New Horizons probe, digitally (and manually) processed by computer, to create the most incredible images yet of the outer world. Although scientists had been fully expecting to find frozen nitrogen on the surface of Pluto, the variable extent of frozen methane across the planet's surface has been a real surprise. Methane is, of course, a hydrocarbon, and Pluto is covered in the stuff. One particular zone which is rich in methane also shows a strong spike in carbon monoxide, meaning that carbon, hydrogen and oxygen are all present in this frozen, primordial hydrocarbon soup. NASA thinks it most likely that the abundant methane is primordial, "inherited from the solar nebula from which the solar system formed 4.5 billion years ago", and not the by-product of space cows (2). 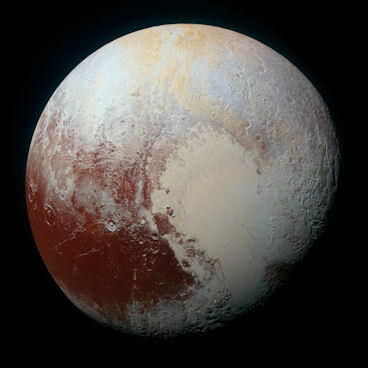 Given the remarkable complexity on Pluto's surface, what, I wonder, is going on beneath the surface? Does a richer concoction of hydrocarbons lie beneath these surface features, warmed by Pluto's traumatised inner core and its proximity to the large moon Charon? In other words, does the presence of these simple compounds on the surface, methane and carbon dioxide, lead us to expect a load of organic chemistry going on within? The surface features of Pluto are incredibly varied: Mountains, glaciers, dunes, gullies, ridges and scallops; all vying for the attention of geophysicists. Many of the formations and variations are not only highly intriguing, but also incredibly beautiful. NASA held a big news conference today (Monday 28th September) about the discovery of running, liquid water on the surface of Mars. 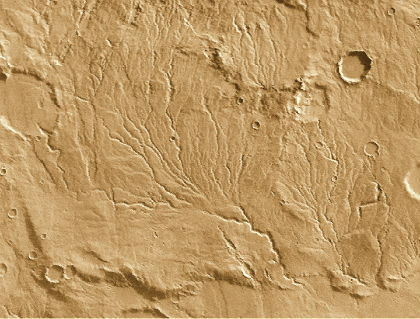 Far from being an ancient flow of water which had left its mark across the landscape of a desicated world, this finding reflects changing features on the surface of Mars observed over the last few years. In other words, there is a seasonal flow of water (almost certainly a concentrated salty brine) currently taking place on Mars - a concept that, until very recently, was thought to be absolutely out of the question. Rocket propellant freely available on the Martian surface? That's handy... Let's jump into the realm of Zecharia Sitchin's theories for a moment. He proposed that aliens (known as the Anunnaki in the ancient Mesopotamian texts which recorded their mythical endeavours), not unlike us in appearance (there's a reason for this...) visited the inner solar system in the past, colonising Earth (to mine for gold), but also Mars (5). I've often wondered why the Anunnaki might have gone to Mars; a harsh, inhospitable world of seeming little strategic importance. They wanted gold here on Earth, says Sitchin (something to do with repairing the atmosphere of their world, Nibiru, which may be synonymous with Planet X). Maybe they were harvesting something else on Mars? Maybe Mars was their refuelling depot for the long journey back home? Perchlorates are fairly toxic (just to add more complexity to any missions to Mars, either by us or by 'them') and extracting clean water from these brines could be a problem. However, some microorganisms are known to live on these compounds on Earth, which elevates the possibility of that same kind of life thriving on Mars. 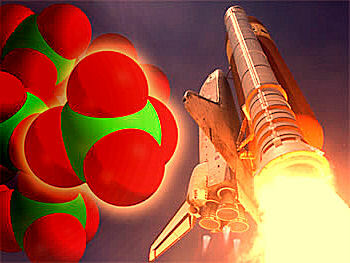 So these compounds, readily available on the Martian surface, could provide the oxygen needed to survive on Mars as well as the rocket fuel to get back to Planet X/Nibiru. The low gravitational pull of Mars, combined with its poor atmosphere, make it an ideal world from which to embark upon a long rocket trip. 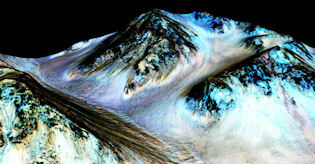 Mars may not be so useless after all. There were a couple of fascinating developments in the field of archaeoastronomy this month. Firstly, a new line of stones, dating back some 4500 years, has been discovered very close to the Stonehenge monument in Wiltshire, England (1). The 90 stones, each of which may be as high as 15', were toppled some time ago, and are buried under the earth. They were recently discovered using ground radar techniques. The line of stones, probably Sarsens, is set along the south-eastern ridge of an ancient earthwork site. The potential archaeoastronomical significance of this will not be lost of readers of this blog, I would imagine, although this is merely hinted at by the archaeologists who discovered it. Rather, they think the stones are some kind of ritual or theatrical device set into the landscape to impress. Yeah, right. It seems much more likely that they are designed to mark out points on the horizon where the Sun, Moon and stars rise. The ancient landscape around Stonehenge appears to be literally littered with additional sites which, through the use of ground-penetrating radar, are only now coming to our attention. The second item of interest is a new article written by Andrew Collins about the even older site of Göbekli Tepe in Turkey (2). The article is probably a bit too speculative in terms of targeting a specific constellation, in sharp contrast to the very restrained analysis by the academic astronomers working on 'Stonehenge 2', but it's nevertheless an informative read with an excellent selection of images. Encore merci pour votre autorisation d'utilisation de votre image sur la planète X. Mon livre est enfin publié. Hélas je n'ai pas encore pu chercher à en faire une traduction anglaise. Il me faut d'abord tenter de rembourser mes frais de participation à l'édition par la vente de mon livre en français ! "La surprise du Chef créateur. Sedna, Némésis et Tyche (planète X et G1.9)"
Merci encore pour votre aide et gentillesse. "The author is a scientist, holding a degree in Physics and Nuclear Chemistry from the University of Advanced Studies. An engineer and consultant, he was responsible for major international energy projects during 40 years in the industry. Now retired, he devotes his free time to writing scientific books, giving lectures and inventing patented industrial equipment. A researcher in the fields of energy-matter and gravitational control, he is an astronomy and astrophysics enthusiast. His theory about the birth of our solar system is a rigorous analysis of previously held assumptions and inconsistencies over centuries. His argument is that the worlds of the solar system may have had a double origin: arising from a gas condensation nuclei, increased later by the capture of enormous quantities of meteors following a very particular near-collision." It's easy to misinterpret when reading complex material like a new physics theory in a foreign language, and, unfortunately, this work is not yet available in English. But from what I can gather from reading extracts of the book in French, and from email exchanges between myself and François, his hypothesis involves the need for a large transiting star to facilitate the formation of planets. In a way, the transiting star, which in the case of the solar system would actually need to be more massive than the Sun, acts like a catalyst does in a chemical reaction, but in this case gravitationally. 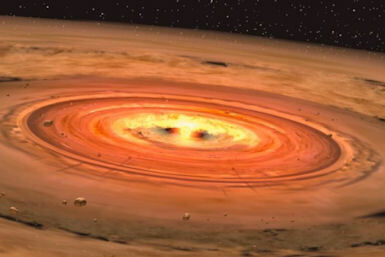 The implication of this idea is that planetary formation is not necessarily an automatic process shortly after the birth of a new star, but may be an event that occurs some time later due to a stellar fly-by. Most likely, the transiting star would have arisen within the same stellar nursery, and would thus have been in reasonably close proximity to the subject star from an early stage. 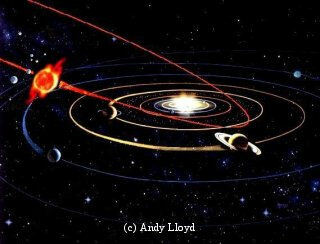 How would this help us in our understanding of the early solar system? I suppose the main change would be that for the Sun to have its own planetary system (an a priori position) it had to have experienced a flyby from another large star, rather than having been a solitary star throughout. 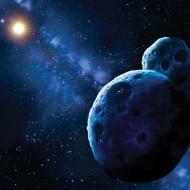 That allows for the transmission between the two systems of material; comets, planets, possibly even sub-brown dwarfs. Thus, there would, I guess, be an expectation of anomalous material and orbital paths in the outer solar system, as the underlying assumptions of how the planetary system forms in the first place are fundamentally different. So why drag in the need for a stellar flyby to catalyse the process? Well, there are problems with the standard accretion model, problems which often call for fundamental migrations of sizeable planets within the system over time for the models to be successful. What causes those migrations? Are there not external factors at play in any case? As far as Sitchin's Celestial Battle scenario goes, one might imagine that the usurper Marduk, a sub-brown dwarf in my Dark Star revision of his theory, rides into the nascent Solar System on the tailcoat of a flyby star, and becomes captured by the Sun during the melee. The issue would be how well formed is the Sun's planetary system by that point? How old is the Sun by then in comparison? What Berguerand brings to the table is the potential for the timings to be radically different from what has been previously considered. It's worth bearing in mind. Continuing the French theme, I've recently completed a new painting: "Le Baiser de l'Hôtel de Ville" ("The Kiss at the Town Hall"). It's based upon an iconic photograph by Robert Doisneau (1950) which I recreated as a colour painting (September 2015, 14" x 10" acrylic on canvas). I originally painted this famous scene in 2006. The photograph is a favourite of Fiona's. This month, I received an email requesting use of the image of the painting in a film about Robert Doisneau. The film is being produced by his family, for the French TV channel 'Arte'. His grand-daughter, Clementine Deroudille, wants to include several recreations of the photo in the movie, to show it's status as "a cliché all around the world". As I sold the original to a lady in Windsor some years ago (no, not that lady...), I decided to recreate the painting this week, so I could provide Robert Doisneau's family with a high definition image of the work. I'm very proud to be involved in this project. As far as I know, my paintings are the only attempts to create a colour version of the classic black and white photo. Fingers crossed that they use it. As anyone who has experienced a premiership match from 'The Shed' will tell you, Gloucester has a mighty strong passion for rugby. For the benefit of American readers who aren't acquainted with rugby, it's a bit like (American) Football, but without all that health-and-safety nonsense. There are two forms of it, Union and League. In England, Union is usually played in the south of the country, League in the north. Union is the bigger game both here, and internationally, and this month the sport's World Cup has been held in England and Wales. Some say that the Rugby World Cup is the third biggest sporting event in the world, but such a claim seems rather tenuous (1). Nevertheless, with teams from over 100 countries competing to make it into the finals, and with an ever widening global reach to sports-mad TV audiences, rugby is on the up. 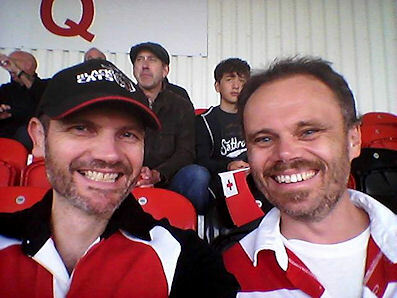 Tickets for the four World Cup matches being held at Gloucester's stadium, Kingsholm, were hard to come by, but my brother managed to get hold of two tickets for the Tonga versus Georgia match. An amazing experience! Rugby is huge here, out of all proportion to Gloucester's size as a cathedral city of about 130,000 people. Sports 'legacy' is often over-hyped, but it's been a great honour for the city to be a host for several World Cup games, and it has created a level of excitement here that will be a positive influence for many years to come. If you still don't know much about the sport, you should check it out. Lose that body armour and helmet, and get stuck in!